As smartphones become a connection of our lives, even our favorite celebrities are trying hard to connect with us through the medium of mobile. Recent news broke that more and more famous personalities were developing their own mobile game applications. The truth is that it’s not a new trend in Hollywood, as we have seen many celebrities enjoying their own special digital connection with their fans via their own mobile apps in the past. But, mobile game applications for celebrities – that’s something else. Reality show star Kim Kardashian recently released her iOS and Android game application called ‘Kim Kardashian: Hollywood.” The free for all lifestyle simulation game was developed by Glu Games Inc. and was released in late March of this year. Made for casual gamers, the developers said that the game wasn’t just for Kardashian fans, but also for those who enjoy connecting with other gamers online. Take note, however, that this title is not intended for young gamers (12 years and below) as it has frequent adult themes. But, so far, it has garnered a huge amount of downloads since its release. Think Gaming said it’s the 9th top grossing games as of August 12, 2015 with a daily revenue estimated at $192, 571 with 4.8 million daily active users. We don’t expect professional, technical gamers to understand and love the game – because why would they even spend precious space on their smartphone to install an application that teaches them about A-list lifestyle. But, if you are one of those that want to experience virtual Hollywood and have plenty of time to kill, then by all means install the game on your smartphone because it’s a great way to waste time. Just check out this full review by Jessie Holova of The Fashion Spot. Apart from Kim K, Glu Games revealed that they are also working on producing other celebrity mobile games with Nicki Minaj set to be the next celebrity with her own mobile game. Glu CEO Niccolo de Masi was ecstatic to reveal that his team is working on the hip hop queen’s official mobile game, focusing on the music industry rather than A-list lifestyle like Kardashian’s app. “Nicki brings to Glu her audience of over 100 million social followers and a new music category. We look forward to combining Nicki’s distinctive style and massive global appeal with Glu’s celebrity social gaming expertise,” de Masi announced in the news. The Nicki Minaj game application is set for release next summer. Prior to big personalities having their own mobile games, some of them were already chosen by big mobile companies to endorse their newest devices on the market. But, even without an endorser, a mobile device can stand out based on its overall performance. 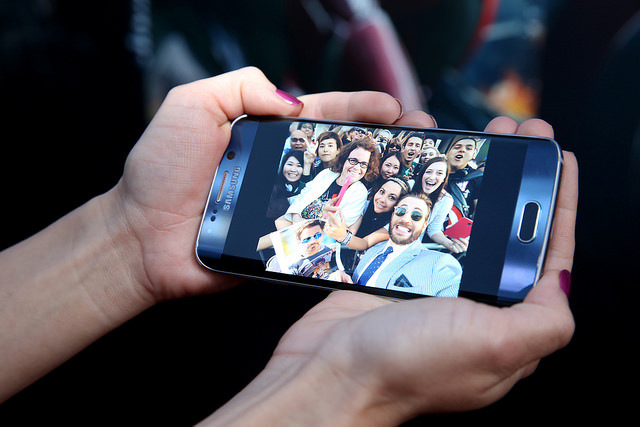 Take for example, the Galaxy S6 that Nick Cannon endorsed on his social media. Through a local service provider, Cannon received the handset and was very impressed by its overall performance. Even O2 has commended the handset as the first smartphone to run Intel’s 14nm processor, known to be the fastest and thinnest chipset so far. But, even without Cannon in the picture, the device will still be a popular smartphone on the market. Why? By having a compelling device, you won’t even need celebrity endorsers to expose it to their fans. It will make a name on its own. Likewise, celebrity mobile game apps should have compelling, engaging, and interesting gameplay and user experience that casual gamers love and look forward to in a game. It seems that the trend of celebrities having their own mobile games is showing no signs of slowing down, especially since more and more people are getting connected using their smartphones and tablets. What do you think about celebrities and their mobile games? Tell us about what you think about this trend in our comment section below.